Over the last while I’ve been working through a stack of unread books by friends of mine. They are good. You should consider using your human money to add them to your stack of unread books. Not a crime book, despite being shelved in a lot of Crime sections, but it has the focus and drive of a screenplay – this sure ain’t a ponderous tale. There’s a lawyer defending a child accused of murder, while he himself is reminded of his own rough childhood and his relationship with the woman who fostered and then adopted him. The beauty of this book is that second relationship. Sometimes the imagery doesn’t quite land and you might see some twists coming but there are plenty of vivid characters here and Minnie is the most fascinating. You’ll find this one at your local bookstore, in the UK/Aus/NZ at least. Little Brown have been pushing it hard, it was a Richard & Judy pick, etc. The author, Lisa Ballantyne, was a workmate & drinking buddy & occasional writing companion in my Scotland days, and I couldn’t imagine a nicer person to have a big publishing success story. A great, fun read for young’uns (I dunno, age 8-10 maybe? 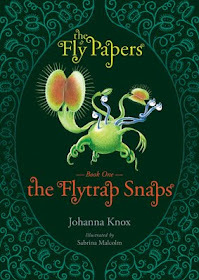 Who knows from age appropriateness) – kid adventure about a boy who befriends a sentient mutant venus flytrap and gets caught up in sinister goings-on. Great characters (particularly every single female character) and an even greater setting – a kind of kids-imagination version of what a filmmaking town would be like. This was nominated for children’s book of the year and I can see why. Johanna is based in the Wairarapa, and is an excellent lady. The dystopic satirical world of Paranoia has long been under-recognised as one of the greatest of all “story worlds” (to use the currently trendy transmedia jargon). It is a future society in thrall to a paranoid computer, while labyrinthine conspiracies and equally labyrinthine bureaucracy reduce everyday life into a series of catch-22 dilemmas. Created for a role-playing game in the early 80s, it has enjoyed ridiculously few forays into other media – three spin-off novels in the 80s, a 6-part comic series in the 90s, and now finally in the 10s there’s another run at using this world outside of gaming. This particular story is a typically Paranoia combination of madcap hijinks and satirical brutality. It follows one member of Alpha Complex, Jerome-G, as he tries to make sense of the insane world in which he lives. There’s plenty of great laughs and action along the way. Oddly enough, the one section that didn’t quite work for me was where Jerome-G finds himself joining a troubleshooter team for a mission – which is the fundamental mode of Paranoia the game version. Great games and the great stories have different needs and rhythms, and here’s a good instance of that. The diversion doesn’t last long, anyway, and it’s still entertaining watching a typical Paranoia screwjob go even more out of control than usual. This is only available in ebook. Free preview chapters at the link! Local publisher Steam Press released this great collection of reworked Katherine Mansfield stories last year, and to everyone’s surprise it won over the literary establishment as well as the genre folk. The Cowens have a wicked, understated sense of humour in how they choose to subvert each of the chosen Mansfield stories, and in many cases these literature-hacks reveal new aspects of Mansfield’s work. Some of them are big and almost goofy, others are sly and mean, others still portentous and sinister. I dipped in and out of this between other reading, and it was consistently rewarding. I loved it. This collection was the work of husband-and-wife cool noodles Debbie & Matt Cowens. They have been making cool stuff of various kinds since before I knew ’em, and that’s a long time ago now. It’s awesome that one of their cool things is getting this kind of attention. These are all good things to read. I recommend them all. Of course I am biased in every case, but hey, I could’ve just said nothing at all! Posted by morgue on Tuesday, February 5, 2013, at 9:53 pm. Filed under Things I've Seen. Tagged books, reading, Writing. Follow any responses to this post with its comments RSS feed. Both comments and trackbacks are currently closed. Lovely reviews – have you considered posting a short version of them on Amazon/Goodreads etc?